They come in many guises. You may call them hoverboards or self-balancing scooters. Whatever the name attached these guys have not come without their controversy. Yet, they are great fun and a must have for the daring, thrill seekers of 2019. They were first launched in 2015. Branded as a cool toy but they actually turned out to have a dangerous side. There were stories of boards exploding and catching fire. Some boards had to withdraw from some cities. In 2016 there was a massive recall programme. In 2019 changes were made to the manufacture of boards and scooters. Before you buy there are certain things you need to know. A hoverboard doesn’t actually leave the ground. They use wheels to roll across the ground. This sounds tame but they are a lot more fun than the traditional skateboard. Why not film yourself using a Selfi Drone! They tend to work by using your own body weight. So when you move forward the board moves forward and they brake and reverse when you move backward. You face forward while riding them and use body movements of your legs, feet, and torso to move in any direction. Are Hoverboards Safe? 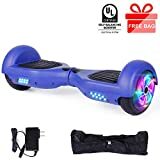 – Now there is a recognized safety kite mark most hoverboards are now made to this standard. What size board do I need? – depends on age and weight. It also depends on the terrain you intend to ride. How old must I be to ride a hoverboard? – the recommendation is 8 to adult. Are hoverboards waterproof? Dependant on the model but most are. Can you ride them on grass? – If you buy an all-terrain board then yes but most are best on the tarmac. What are the Bluetooth speakers and how do they work? – They are usually built into the board and work through your smartphone. How long do batteries last? – once again depends on make and model but up to 4 hours is the norm. For those who have never used a board before to get moving is easy. You step on board and the two pressure sensitive of your legs, feet, and torso to move in any direction. It is a cool workout as you use your core to keep yourself balanced. You feel the burn in your calves and feet since these muscles help you steer. There have been many manufacturing improvements made. You still need to be wary of some brands but the main players have all stepped up to the plate. Boards that are either made or imported into the US have to certified to UL2272 standards. Most major distributors only sell compliant boards. When looking for the best hoverboard for your child the size and age of your child will come into play. The official age rule for most hoverboards is 8 years of age. It is common sense on the whole though to ensure your child can ride and manage the board before you let them loose. Weight is also something to consider. Generally, a 7-inch hoverboard can handle 100Kg of weight. Selecting a hoverboard for your child? 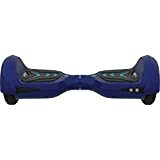 The Swagtron entry level board has all the right features. It ensures your child is safe while learning how to ride the board. As a beginner, you can switch to learner mode. You can learn how to adjust the speed and learn how to balance. The Swagtron also boasts Safe Stop technology. This will guide your child to a balanced rolling stop when your battery stops because it has run out of juice. The Swagtron was the first hoverboard to receive UL2272 certification. It has a lithium-ion battery system called Sentry Shield. This provides multi-layers of protection for your battery if you have a spill. It also has five battery LED indicator lights t show you how much charge you have to play with. Hoverboards have become the latest craze. Many different models and brands are available. It can be overwhelming to determine what type of hoverboard would be best to buy. Here are some tips to help you decide on the right hoverboard. Ease of use should be your first priority. You want to choose a hoverboard that has a large foot area. A rubber footboard makes it easier to mount on the board. Moreover, you get to feel safe when riding. If this is your first time, practice on a clear area before going on to a complicated surface to avoid accidents. Be sure to follow the instructions provided on the manual. Your board should meet the set quality standards. Hoverboard made in the U.S. has to go through testing to ensure that all safety and quality standards. Remember that hoverboards have various electronic components that can be defective over time. Finding a quality board is essential for your safety. So which features do you look for before purchasing any board? Make sure you research and compare the different boards available. When deciding on the right hoverboard, be sure to look up reviews online. You will find honest reviews on sites like eBay and Amazon. This will help you make an informed decision. All hoverboards are not the same. Some are water resistant and can handle rough terrain. Others have LED lights for safety if you are riding at night. If you would like to ride a board without creating noise, there are some boards that are silent. So, let’s get into it – what are the best hoverboards of 2019 and how do they compare? It has a self-balancing mechanism and better protection against collision damage. UL 2272 certified with front-facing LED lights. A large battery pack that lasts for 3 hours. The Swagtron T1 is their first model. It provides value for money and has small cosmetic changes. Yet it still retains a similar classic design. Being UL2272 certified, the T1 is completely safe to ride. It has gone through a strict quality check before coming into the market. With the greatest speed being up to 8MPH, this makes the model safe. It also means that the battery is not drained as fast. The battery, a 4400 mAh cell provides you with 2-3 hours to enjoy the board. As most people wouldn’t use the board at greatest speed the battery will last. and make the board safe to ride even at night. Foot pads are very responsive. The wheels feature a solid rubber material that doesn’t wear off. Looking for safety, you can relax as the model is UL 2272 certified. The T1 is perfect for beginners as it features 6.5-inch wheels which means that it’s closer to the ground. The Swagtron T1 has the patented SentryShield battery technology system. It also features a smart battery management system. This makes battery monitoring and protection of a breeze. Wide array of LED lights. This model from Hoverzon, this model steps up its game. It has Aegis Armor Battery Protection which means advanced battery protection. It protects from many shock absorbing layers. The onboard battery indicator helps you track the battery charge. The Horizon XLS has extra wide foot pedals. These give riders more control and comfort particularly to those who have large feet. You can control the hoverboard from the get-go. The Hoverzon app offers training to new riders. It has a standard mode for people with a bit of experience and a pro mode for people looking for advanced controls. The controls are responsive and the self-balancing makes it easy to get on and off. It has a max speed of 8Mph, you can turn and speed up with ease. Front and rear LED lights and the integrated Bluetooth speaker makes the XLS a cool board. While the speakers sound right, they have a limited wireless range and you’ll need to bring your phone. XLS has great features for its higher price tag. Nonetheless, it still has some shortcomings common to most hoverboards. The Segway Mini Pro offers a dual motor engine. The Segway mini Pro is a great hoverboard for anyone looking to get the best of both worlds. Available in 2 colors, white and black. The Mini Pro has lots of features suitable for both power and advanced users. Additionally, the hoverboard has a handle, something that would come in handy for a lot of users. The Segway Mini Pro has a dual motor engine able to deliver 1600 watts of power. When charged, the hoverboard can reach 10 MPH with a distance of 14 miles. This may vary depending on the terrain. The Mini Pro also has a durable magnesium alloy with 10.5-inch tires. It is able to deliver military-grade shock absorption. The padded knee par provides the greatest comfort. The rider has precision steering, allowing the rider to be in control. The exoskeleton is light-weight and can handle a payload of up to 220lbs. The Segway Mini Pro meets electrical and fire safety standards. Unlike other hoverboards, the Mini Pro has an innovative kneebar. This makes control easy for people to manoeuver when turning left or right. Furthermore, the knee bar control can fit either a tall or short individual riders. The Segway Mini Pro remains a top choice. A top speed of 10mph. This is a beginner’s friendly hoverboard. The Jetson V6 is one of the best right now and has some exclusive features. Unlike other hoverboards made out of aluminum, the entire frame of the V6 is steel. 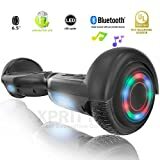 This hoverboard also comes with an app that is available for both Android and iPhone users. 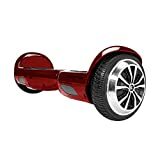 The application lets the rider control various aspects of the hoverboard. Things such as sensitivity and speed. It has 2-8 inch wheels and 2-350 watt motors, the V6 offers a top speed of 10mph and has an impressive range of 15 miles. The Jetson V6 has extra features like LED lights and Bluetooth 4.0 speakers. A cruising speed of 8mph. LG battery that is capable of running for up to 60 minutes on a full charge. Two riding modes are suitable for advanced and beginner users. Razor released their first hoverboard early last year. The Hovertrax 1.0 was a successful model. production stopped when 2.0 came along. The Hovertrax 2.0 comes with new improvements and an awesome design. The outer frame is futuristic and edgy. The foot pads can let you know which side is the front. The headlights are capable of providing better luminosity. The top guards have a rubber strip that provides resilience against collision. The wheels have a wider metal guard, protecting them from lateral impact. Razor Hovertrax 2.0 has Ever Balance technology that allows the rider to stand on it and ride when ready. Additionally, you can find the 2.0 in blue, white, black, pink and red. Each style now boasts of a cool blue LED display. This acts as a turn signal, blinking when you move from side to side. It returns to normal lights when you get into a straight line. The self-balancing features allow a user to limit their speed until he/she changes it back. The battery which you can swap lasts about 60 minutes at the greatest speed of 8mph. Gives you ample time to enjoy riding the hoverboard. The Razor Hovertrax 2.0 is UL2272 certified, meaning that it has met all the safety regulations. The Hovertrax 2.0 is nimble, exhilarating and fun, giving you enough reasons to ride. Alright, let’s clear this up straight from the off. 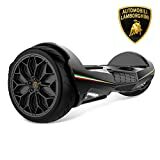 The Lamborghini hoverboard is not made by the famous car maker but it endorsed by the famous car brand. It is a Lamborghini board though because of its speed and it carries the badge. Like it’s car partner it also has some great looks. The Lambo board provides one of the first SUV board rides. It comes twice as powerful and 33% bigger than it’s the rival brand. It provides all the safety features you would look for. It is UL2271 certified and has a certified smart battery. With its massive 8.5 inch wheels it gives the board and unrivaled road presence. This self-balancing scooter has Bluetooth and delivers great stopping power. The Lambo also delivers 10 miles of ride and a battery charge of 2.5 hrs. The board also comes with its own app to give you feedback on your ride and board performance. The app allows you to adjust the board speed and sensitivities. This is a great board but it does have a few gremlins. Some buyers pointed to poor build quality. Also some components not working. The Epikgo provides a great alternative to the Lamborghini board mentioned above. Ability to climb steep terrain. 8.5 inch solid tires with alloy wheels. Waterproof board made from aluminum. Epikgo is a new name in the market that comes with lots of enhancements that makes it secure and fun to ride. Being a UL2272, the Epikgo meets all the set safety standards including the battery pack. While it is costly than typical hoverboards. The Epikgo board has some important features that make the cost worthwhile. The Epikgo boasts of immense powers. It is able to yield up to 2 times more powerful than normal self-balancing scooters. It is three times larger than its closest competitor. The board gives you a stable ride, more control, and a larger footprint. What’s more, the Epikgo comes with a self-charging system. That means that you don’t need to keep plugging into a power source every time the battery goes down. The integrated system can charge the board for 2 hours. With a top speed of 10 mph, the battery can last for up to an hour. The large, rubber tires make it easy for a user to hover on any terrain. Being IPS6-Rated, the casing is water and dirt resistant. This means that you can partly use it in water without causing any damage. Equipped with 400-watt motors, this is the only hoverboard able to climb slopes as high as 18 degrees. While the Epikgo lacks a preparation mode for new users, the big wheels make it easy to learn. White LED headlights also feature little red signals that alert others of your moves. If you are planning to do any rough riding, this should be your top pick. If you are looking for a budget hoverboard, look no further. The Xprit offers a low-cost quality board that gives easy access to buying a self-balancing scooter. It might not have the bells and whistles that some of the other models. 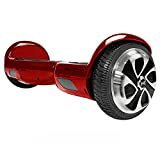 It can give you or your child access to the hoverboard experience and half the cost. The board comes with the battery already charged. The Xprit also offers a Bluetooth connection for both IOS and Android. Weighing only 15Ibs makes it easy to carry around. Having a 6.5-inch wheel also gives it stability and a confident ride. May buyers have bought this board as a birthday or christmas present and it makes a great present. Coming in four funky colors it can be a great intro to riding a hoverboard. The EPC Tek is the perfect board for new boarders both children and adults. For a low-cost board, it has some great features. For a start, performance is good in that it covers up to 8-12miles on one charge and has top speed of 8mph. It has strong double 300W power motors. The EPC TEK is a fun board available in 19 different colors with every board having bright LED lighting. We finish our review with the CXM Hoverboard which is an Amazon choice product. Being well priced the board is ideal for children as the largest weight is only 220lbs. It has a built-in onboard speaker where with the necessary smartphone you can play your sounds through. This smartboard has its own self-balancing technology. If you lean forward the board speeds up, if you lean back it slows down. It is a very easy board for a beginner to master in very little time. This funky board also boasts three different colored LED lights change all the time as you ride. For added safety, it also roots your feet to the board with anti-slip mats on each wheel. Choosing this board gives you a low-cost starter board with many features of an expensive board. What does the future hold for hoverboards as a means for transportation? Several manufacturers are already looking at turning a hoverboard into a wi-fi hotspot. This will mean you will be able to access the internet anywhere while on your board. Another feature being worked on is battery life. Longer battery life will mean more miles to be covered by your board. Finally, Lexus has been working on a true hoverboard using a magnetic field to hold the board off the ground bringing “Back to Future’ alive! Cool selection of hoverboards! My favorites are the Segway miniPro and the Horvertrax 2. Great article! I personally like the Segway MiniPRO, but the other ones are awesome too! 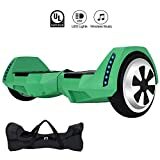 Hi,so glad to found that your website is Amazon affiliate website.Could you write an article or some introduction about this Gyroor Warrior off road hoverboard and give an affiliate link to the Gyroor off road hoverboard on Amazon? Wondering if you are interested in swapping links? We are an Irish website and can link back to your site also. Yes – send over a comment with your link attached and I will do the same.